Why Furnish Your Cold Room? The furnishing of your cold room is important when it comes to organising and maximising your space. The use of different storage equipment within a cold room facility can help in making your storage area more effective in terms of arrangement and the cleanliness of the storage area. MTCSS create bespoke walk in cold rooms perfect for your cooling needs, also offering advice on how your potential cold room furnishings could be arranged and how they will help you with your cold room layout in the long run. Wire shelving allows for high air flow between your shelves. Usually made using nylon coated wire or nickel-plated chrome wire (making them corrosion resistant), this type of shelving is more commonly used to store fresh food items such as vegetables and fruit. Aluminium shelving consists of strong aluminium frames holding shelves that are commonly made of plastic. These types of shelves are made to be easily lifted out of place making them ideal for cleaning. Stainless steel shelving is usually made of 304 grade stainless steel, which acts as an operative way of resisting corrosion. This type of shelving is great for giving an aesthetically pleasing look to your cold room. Polypropylene shelving is manufactured with shelves made with materials fashioned to be solid or with a grille effect. This cold room storage solution provides retention, whereas the grille shelves allow for better airflow to occur. Again, this type of shelving can be perfect for storing fresh foods such as vegetables and fruit products. The shelving unit will have a steel core which gives it added amounts of strength and sturdiness, and that is protected by a polypropylene outer covering. As shown, there are a decent range of cold room shelving units to use in your cold room furnishings plan, each with characteristics to meet your needs in cold storage. Modular consists of a ‘five bar’ aluminium sheet being laid over a polyurethane floor panel containing a layer of plywood. This type of cold room flooring is usually used for light trolley storage and constant foot traffic. Resin flooring tends to be used in cold storage areas that require to be used as production areas and need to be kept up to standards in terms of cleanliness. Concrete flooring for cold rooms tends to be recommended for heavy-duty operations areas. It consists of reinforced concrete slabs being laid over extruded insulation. This forms a hard wear surface for the cold storage room. Vinyl flooring is perfect for cold rooms that need to be kept clean. Altro is laid down as flooring, then being fitted against the walls of the room. This creates an easily cleanable, sealed flooring space. These cold room flooring types can be used in your cold storage unit and each fulfil a particular purpose for how you need your cold room floor to be. Strip curtains for cold rooms are a constant feature of cold storage as they can be an excellent way to save energy. Strip curtains hang between your cold room door and the actual cold room itself. The main purpose of strip curtains is to reduce temperature loss from cold rooms. Mainly important in the food production industry, strip curtains actually help in saving up to 60% temperature loss from a cold room. These almost transparent, flexible curtains help in saving energy costs by reducing temperature loss when the cold room door is opened. Entrapment alarms for cold rooms are an imperative furnishing for any cold storage area. Commonly found in food production sectors, entrapment alarms allow for health and safety to be taken into account at all times. These types of alarms allow for staff members to alarm their colleagues if they are accidentally trapped in a cold room, or notice a fault in the cold room door. SON low bays are common in terms of choice for cold rooms. This type of lighting gives off a warm appearance but can take quite a few luminaires to achieve a reasonably well-lit area. Aragon is produced using a polycarbonate body, creating good lighting. It creates the effect of white light and giving off no glare. If in the situation of needing a lamp replacement for this type of lighting, replacement is cheap and easy to carry out due to the fixed, stainless steel clips. The Nextrema LED is a lighting source that is specifically created for areas that are cold and/or damp. The advantage of this type of lighting is that it works better in colder climates. Nextrema LED lighting can achieve between 5 and 10% more output in a cold room compare to a room of normal temperature. MTCSS is an established specialist company with expertise in the installation of cold storage solutions and industrial doors. Stationed near the motorway network of Worcestershire, MTCSS have the advantage of being able to practically serve all customers across the UK. 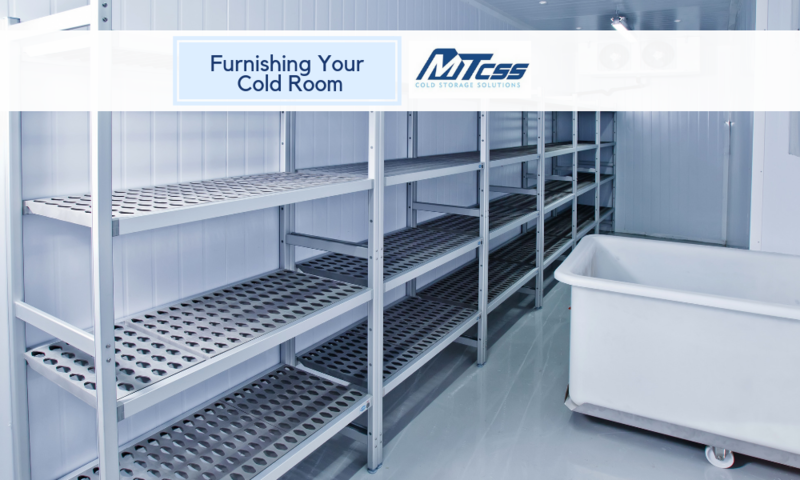 Have some questions on how MTCSS can help with your cold storage solutions or cold room furnishings? Contact us today. Call us on 01886 833381 or alternatively email us at sales@mtcss.co.uk, one of our specialists will be happy to help you with any query you may have.